Pioneer reveals N-70AE and N-50AE network players | What Hi-Fi? 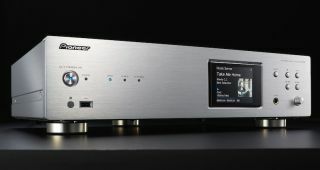 Two new network audio players with an array of features, including integrated Chromecast and Spotify Connect, wi-fi and Bluetooth. Pioneer's new network audio players, N-70AE (pictured above) and N-50AE, have been launched at the High End Show in Munich - they're here to "fulfill the audiophile’s desire to enjoy the full spectrum of network and hi-res sources". The tech that's been incorporated to try and fulfil those desires? For a start, the two audio players have Sabre32 Ultra32 DACs, able to support up to 11.2MHz DSD files. FLAC, WAV, AIFF and Apple Lossless files are supported too, up to 24-bit/384 kHz quality on the N-70AE and 24-bit/192 kHz on the N-50AE. Both models also offer built-inChromecast and Spotify Connect, wi-fi connectivity (over 5 GHz and 2.4 GHz bandwidths), and Bluetooth. You'll always know what's playing, as album covers are displayed on the 9cm square screen. If you store music on a portable hard drive, you can also plug it into the USB input on the players' rear panel, from where it can be accessed by computers connected to the same local network. Pricewise, the N-70AE starts at £1100 while the N-50AE is £800. Both will be available in July 2017.